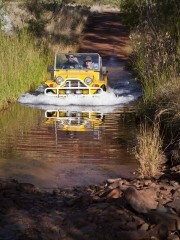 We both have very good memories from the last time we were at Karijini National Park (June 06). 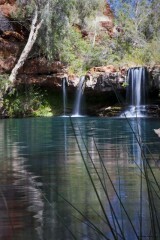 Karijini is without a doubt our favorite park in all of Australia (I know, we are a long way from having seen them all). We are back at the park and again enjoying the walks and the wonderful scenery. 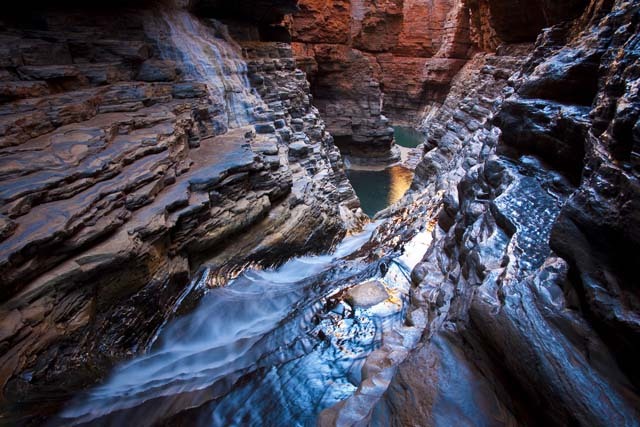 What is so great about Karijini? Well firstly, the scenery is amazing, each gorge is spectacular. Not in a massive "Grand Canyon" sort of way, more of a delicately carved sort of beauty. Secondly, the entire gorge system is very accessible. 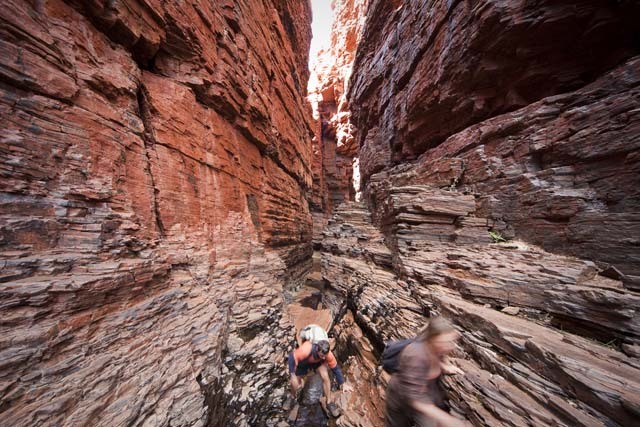 We think it is fantastic that it is possible to climb down inside each gorge and walk its length and see it up close. In some cases it is necessary to swim for 20 or 30 meters to continue the walk. This makes photography even more challenging. Thirdly, the park is not "over-managed". There are not dozens of park rangers patrolling every walkway, there are no fences and barriers stopping people from approaching cliff faces. There are not signs warning of every slippery rock and vertical drop. 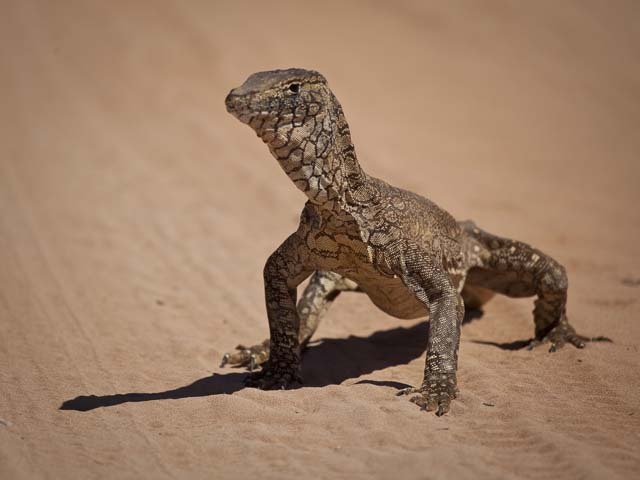 At last a national park that credits people with a little common sense! Each trail is given a class according to the level of fitness, skill and equipment required to walk it. The trail is clearly marked and that's it! If you fall down a rock face because you were too stupid to understand that a class 6 walk requires ropes, abseiling gear and the skills to use them ... too bad. 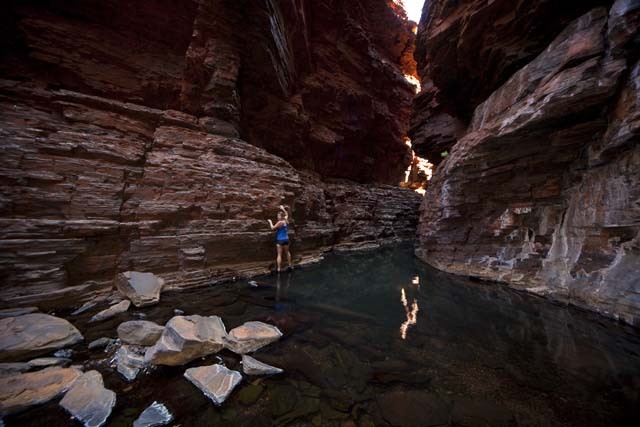 Congratulations Karijini NP management, this is a world class natural wonder, and in my humble opinion, you are doing a fantastic job of looking after it while at the same time allowing people to experience it. Our first walk was in Dales Gorge. A nice easy walk to start on and we really took our time. With every piece of camera gear that we own on our backs, other walkers sped past us all day. Having all day to walk and photograph was great and we are both very happy with the results. I have been looking at and considering upgrading my camera to the new Canon 5D MkII. This camera produces 21 megapixel images (almost twice what my MkI can produce) - photographing in Dales Gorge has made me think about it even more... still thinking about it. We camped in the Dales camping area (at $13/night) for a couple of nights. This is a nice area, with the individual camps well spaced. Apart from pit toilets, there are no facilities (there is a water tank about 10km from the camp). From Dales Gorge, we moved to an area (just) outside of the park - an un-official free camp. 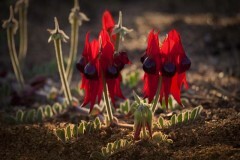 We have made this our base for the last few days and we have explored Weano and Hancock Gorge - both very spectacular and fairly challenging (particularly with a pack full of camera gear). Man, are we gorged out! Walked every gorge in Karijini at least twice. Still, it was great to see the gorges at different times of the day and in different lights. We took hundreds of photos - some of them are even quite good. 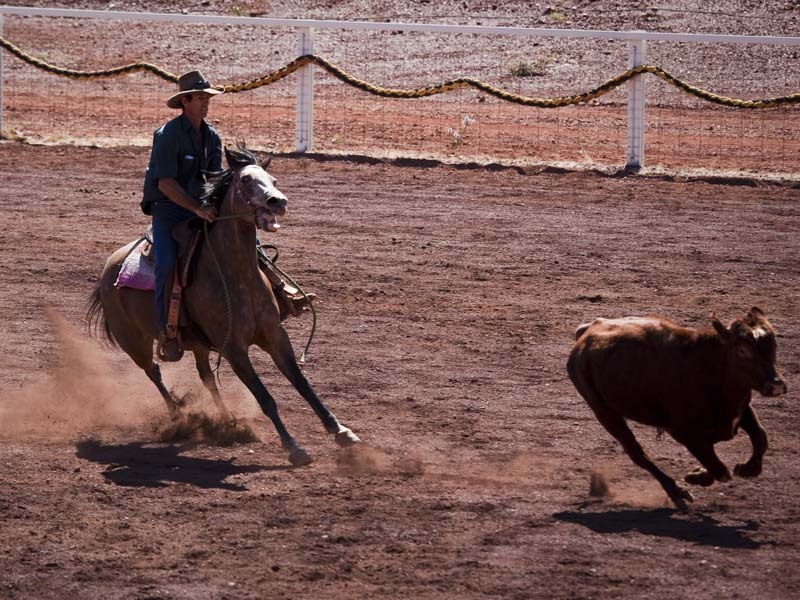 We took a break from gorge walks to watch the Tom Price campdraft. 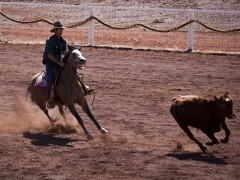 A campdraft (for those who like me did not know) is a little like a rodeo - but it focuses more on real world cattle handling horseback skills. There is no roping and no bull riding. The point is to show your horse-rider skills in dealing with cattle. We really enjoyed watching the events and photographing them. I did order my Canon 5D MkII camera and I have now received it. I have not really had a lot of time to play with it, but from what I can see, it takes a really nice photo. 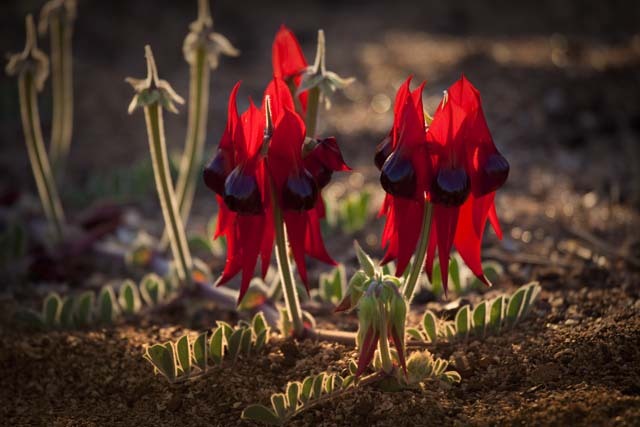 From Karijini we headed to Wittenoom, The town of Wittenoom has an interesting history having once been a thriving outback town supplying workers to the nearby mine. Unfortunately the mines function was to extract asbestos from the gorge system. As we all know asbestos became very very unpopular once the negative health properties of dealing with the stuff became known. Wittenoom is now a ghost town - a few of the buildings remain and the population of 6 people now enjoy the solitude that only living in a contaminated town can offer. We spent one day exploring the gorge system (holding our breath most of the time) - it is a truly spectacular place with crystal clear running water and some fantastic swimming pools. It is such a shame that it has been made unsafe. You can see blue asbestos on the ground - I confess, it made me very nervous. 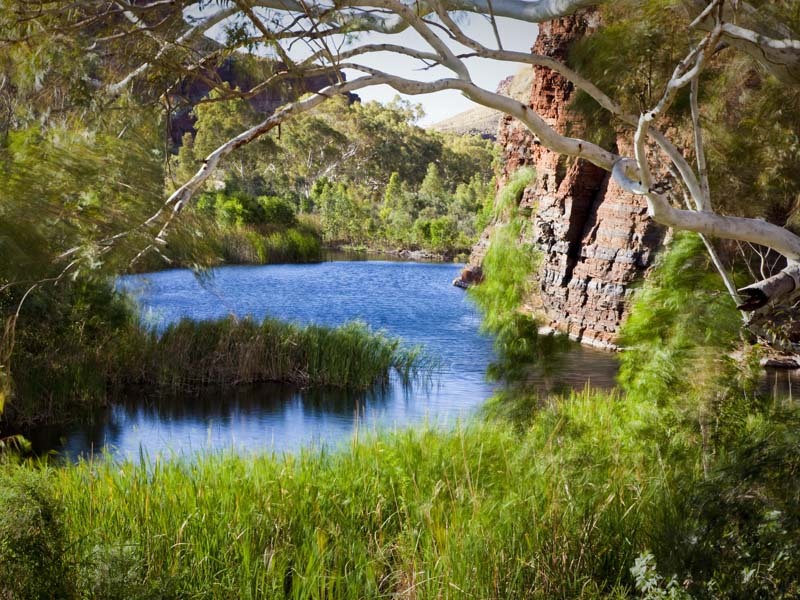 We headed north west from Wittenoom and into Millstream National Park. I guess it was because of the extent of dirt road that isolates the park that made me expect it to be quite deserted - wrong. 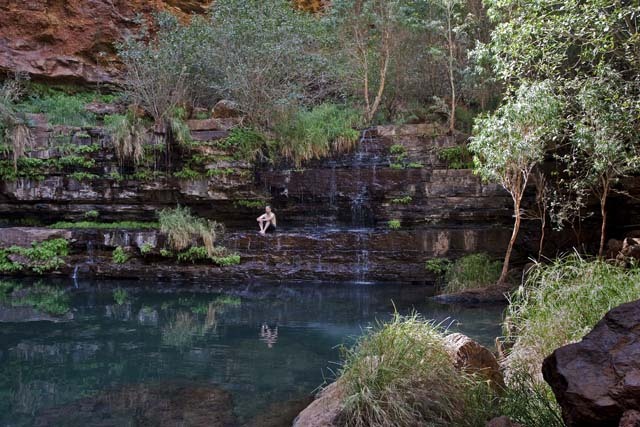 There were more people at Millstream than there were at Karijini! The old station homestead has been converted into a visitors centre and there are a number of interesting displays. One if the really nice things is the FM radio station that plays a continuous loop of information about the national park, the history of the station as well as lots of information about the wildlife that lives in the area. The wetlands in the middle of such a dry area is a magnet to all sorts of birds and native animals. From Millstream we drove west and back to the coast. Our inflatable boat the "Diveyak" got it's first wetting of the season at Cleaverville (a few k's north of Karratha). We paddled over to Dixon island and had a very successful day spear fishing. The freezer is once again so full of fish that there is no room for ice-cream (not a good situation). From Cleaverville we made our way back to 14 Mile camp. It seems that the wind has not stopped blowing since we left 14 Mile a month ago. You would think that all this wind would be great for the wind turbines - not so. Since we left a number of the turbines that had been erected along the beach front have failed. It seems that perhaps the Chinese manufacturers have never experienced the west coast wind! While at 14 Mile and in a typical westerly blow, I was disturbed to see our wind turbine pushing the battery voltage above 31 volts. This was enough to make the inverter raise a high voltage alarm. Jaycar ... we need to talk. We are currently on our way south towards Perth. We are taking a short visit home to New Zealand for the wedding of my eldest daughter Zoie. We will only be gone for a couple of weeks, but from what I hear of the temperatures in Dunedin at the moment, a couple of weeks may just be enough. We are both really excited to be heading over there to share Zoie and Richards big day ... I don't normally cry at weddings but this might just be my first. 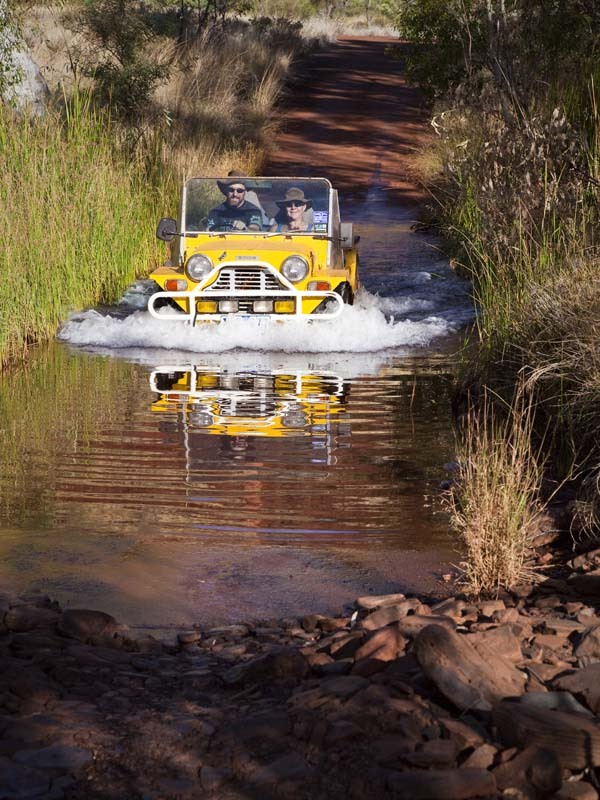 We have a list of jobs to be done in Perth when we are there - most importantly having the suspension in the Moke repaired, it has collapsed due to being pulled down so tightly (perhaps too tightly) in the back of the bus. We can now not get it out of the back of the bus (it has been suggested that we tie the Moke to a tree and drive the bus away to pull it out - seems a bit brutal to me). We also need to get a new starter motor for the bus. It was making a strange sound so I removed it and disassembled it. Unfortunately once I reassembled it there was one tiny part "left over". It still works - but as the bus is a bit big to push start, I would rather get a replacement.